Size of the INDUSTRY The diamond industry in India today is worth about Rs. 6000 crores and is rated amongst the fastest growing diamond markets in the world. Output per annum Indian has exported rough diamonds worth US$ 566 million in 2007-08 and polished diamonds of worth US$ 14.18 billion. Percentage in world market Today India is the largest diamond cutting and polishing center in the world, it enjoys 60% value share for diamond cutting and polishing. 85% volume share and 92% share of the world market in terms of number of pieces. Indian subcontinent has been always the center stage in the dramatic history of some of the world`s most famous mesmerizing diamonds. India is one of the earliest known source of diamonds. Today Indian Diamond Industry is pioneer in the gem industry and a world leader in the manufacturing of cut and refined diamonds. 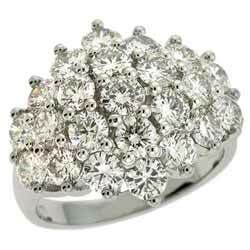 Diamonds today nine out of every ten come from India which is used in jewelry worldwide. Indian Diamond industry is mainly involved with cutting, polishing and exporting diamonds. Indian Diamonds cut and polished are universally prized & India has emerged as the largest diamond-cutting center in the world. Today although India pioneered in the cutting of small diamonds, its craftsmen are equally skilled at cutting all shapes and sizes of stones, and are even well-versed at faceting colored diamonds. Mumbai, Surat, Ahmedabad, Bhavnagar and many small towns in Gujarat are the main polishing centres in India. The Indian Diamond Industry employs one million people, accounting for 95 % of the workforce of the world`s diamond industry. Today the Indian diamond industry is a result of perseverance and hard work. As after India became independent in 1947, for next several years the nation`s economy was in the depression. Several views for business and commerce opened up as new policies came into place, journey towards progress and development also began for the Indian diamond industry. Only three decades ago the Indian diamond industry was a scattered cottage industry. Today it has gradually evolved into a modern, mechanized, large-scale operation. As India has the art laser machines, lathes and diamond-impregnated scaives, most of the medium- and large-sized diamond factories are well operational. Indian Diamond is found in one of the earliest references in "Arthashastra" written by Kautilya who mentioned the diamond trade in India. Diamonds were traded to East and West India while they were known to different cultures. India remained the leading diamond producing country till 18th century AD. Then diamond even reached the ancient city of Rome from India. However it is the diamond mine of Golkonda in India that became a legend around the world, which is now a ruined city of south-central India was the capital of the ancient kingdom of Golkonda. It served as the diamond center in earlier days. Indian Jewellry is made scrupulously by hand and was traditionally crafted by family jewelers skilled in a particular style. India`s artisans with traditional skills dominated contemporary techniques to provide the world with jewelry that conformed to international standards. Today there are new generations of young designers dominating the world market, apart from a host of established houses that design the fashion jewelry. Across India and several jewelry design institutes, encouraging fresh ideas and talent. The zenith body Gem and Jewelry Export Promotion Council (GJEPC) is dazzling and growing industry. The council was set up under the patronage of the Ministry of Commerce in 1966 and has helped to form a better understanding between the diamond industry and the government. The chief function of the council is to develop and promote the export of gems and jewelry from India, to contribute towards establishing a code of ethics to ensure that fair trade practices are followed in the jewelry arena. Indian diamond Industry is at the doorstep of expansion today. The Indian government has legitimated the setting up of bonded warehouses in order to enable diamonds to be brought into the country to be sold. The unsold diamonds could be exported without any duty or tax. Government has been creating the Export Promotion Zones (EPZ) and Special Economic Zones (SEZ) in order to help and promote the export of gems and jewelry from the country and is undoubtedly a new step for the betterment of the industry. The Indian diamond industry has its origine in the villages, towns and cities of Gujarat, where most of the processing facilities are installed; the corporate operations of marketing and finance for all the diamond traders takes place from Mumbai, where all the major traders have their registered offices. Majority of the diamantaires procure the rough diamonds from the Diamond Trading Company which holds the maximum share of rough diamonds in the world. 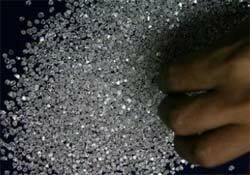 India's diamond industry is expected to remain stable on gems and jewellery exports, credit rating agency Crisil said. "The credit risk profiles of India's diamond and diamond jewellery players will remain stable over the medium term, on the back of steady demand expected in key markets, and improved prices of polished diamonds in 2010-11," Crisil said in a study of the 142 players in the industry. With the improvement in global demand, the prices of cut and polished diamonds rebounded in the second half of 2009-10 from weak levels in the second half of 2008-09. Looking ahead, Crisil said, "Demand from the US market, which accounts for more than half of India's gems and jewellery exports, will be steady, backed by a stable economy, and will result in moderate buoyancy in exports by Indian players over the medium term." However, it cautioned that the prevailing crisis in Europe may affect exports. 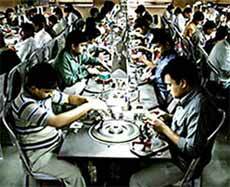 Indian Diamond Industry currently constitutes about 15% of Rs. 900 crores approx. of the market and is growing at a rate of 40%, and this is attributed to many factors such as higher disposable incomes, changing outlook and attitude of the consumers, aggressive marketing and promotional activities by the branded players. The diamond industry in India today is worth about Rs. 6000 crores and is rated amongst the fastest growing diamond markets in the world. India ranks third in the world in domestic diamond consumption behind only to USA & Japan. The year 2004 had a 27% nationwide increase in diamond sales. In the year 1994 the Branding of diamond jewellery started with Gili from the house of Gitanjali Jewels and today the diamond jewellery market has about 50 brands. Today India exports about 90% of Diamonds to the US. In the year 2008-09, during April-January 2008-09, the exports of cut and polished diamond declined 2.85 % to $11.34 billion, in contrast to a 6.63 % growth to Rs 11,020 crore during the corresponding year. Today Indian exports of diamonds increased and in turn it reflected greater than before in the export of designed jewelry. The evident fact that the Indian jewelry designs have for centuries spell bounded everyone, from the Indian maharajas to the monarchs of faraway lands. The Indian diamond trades over 40% of De Beers exports to India, accounting for nearly $400 million, are composed of Argyle roughs and more than half of India's 5500 diamond manufacturers depend on this business for their livelihood. Adora is the Diamond brand launched by a Mumbai based Jewelry Corporation. The brand is themed on love and celebration of life and is trusted by many celebraties like 'the Nightingale of India', Lata Mangeshkar. Tanishq is one of the most popular diamond jewelry brands in India and is known for its innovative designs. It is promoted by the TATA group and launched in 1995 and boasts of 84 outlets in 61 cities. Tanishq introduced the 'collections' strategy in Diamond jewelry. Kiah is another Diamond brand which is deemed stylish, light weight and striking launched by Sheetal manufacturing company in October 2004. Nirvana Diamonds were launched in 1987 by Fine Jewelry (I) Ltd. Implementing the state of the art technology, the collection is targeted at fashion conscious, modern and independent women. D'damas is one of the oldest diamond houses of India found in1966 and forming a part of the Gitanjali Digico Group. The jobs of Gemologists or the Diamond cutter or the manufacturer require high skills as it involves identifying and grading of diamonds, precious and semi-precious stones and other related aspects. Due to the increase in jewellery export there is demand for more and the national and international companies in the field are setting up new centers in India and are recruiting trained professionals to keep the pace with growing international market. A trained gemologist or Diamond jewelry designer can find attractive jobs in India or a sparkling career abroad. Today India is the largest diamond cutting and polishing center in the world, it enjoys 60% value share for diamond cutting and polishing. 85% volume share and 92% share of the world market in terms of number of pieces. India has exported rough diamonds worth US$ 566 million in 2007-08 and polished diamonds of worth US$ 14.18 billion.Exports of Cut and Polished diamonds form 14% of the total India's foreign exports. Total gem & jewellery exports US$ 15.7 bn (2004-05)World's largest diamond cutting and processing center with estimated workforce - 800,000 skilled craftsmen is India. 60% global market share by volume and 80% by volume, 94% of global workers in diamond are Indians, 11 out of every 12 diamonds polished pass through Indian hands. 50 banks provide US$ 3 bn credit Manufacturing and sales offices worldwide diversified into jewellery manufacturing since 1990 the Diamond Jewellery market inclusive of exports: Rs. 13,000 crores approx.